In recent weeks we have been looking at lots of different inspirational homes, some have been a bit bizarre, others have been secret paradises, but all have been loved by their owners. 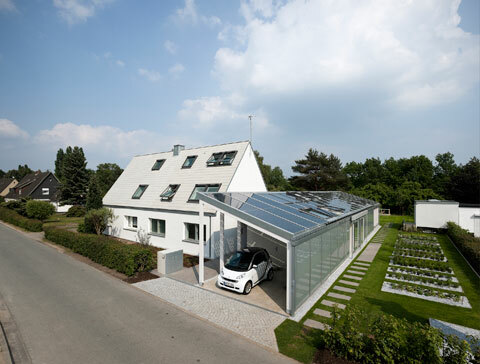 This blog is looking at homes that have 2 aims in life; to be energy efficient and look incredible. Take a look at the following houses and leave us a comment telling us which is your favourite. We start with a blog that was posted recently called Floating Homes. The river Thames will have an energy efficient house built 10m away from the waters edge, combating the threat of flooding and the dependency on energy companies. 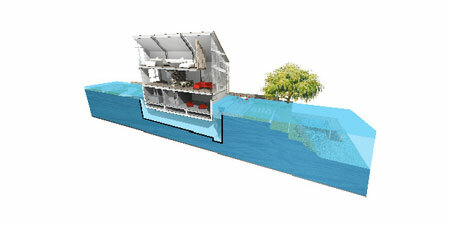 This intelligently built home floats within its docking should a flood occur, preventing any damage. It’s a highly insulated building with low energy usage, built with full length energy efficient windows on the south facing side of the house, harnessing light and heat from the sun, reducing the need to turn on the heating. Energy efficient windows are one of the top materials to use in an eco-friendly home and I think they will continue to be developed as part of the future in green housing, pushing the world into a cleaner, more energy independent place to live. I love this house purely because of its ability to adapt to its surroundings. It will subtly sit on the waters edge with some lovely views out of the large living area. The fact that it will be energy efficient is a bonus and when it is built, whoever owns this will be a very lucky person. This house was built in Hamburg in the 1950’s, but it has been modernised and extended to create an energy efficient house. Combining photovoltaic’s, solar thermal energy and an air-water-heat pump, the house is a self-sufficient beast, independent of external energy. This design was created by Katharina Fey, a student at the Technical University in Darmstadt, who entered the Velux Model Home 2020 competition. Utilising the sun is one of the most efficient methods of powering and heating your home. Using roof windows the house harnesses the solar gain during the winter months reducing your heating use and giving you a comfortable climate to relax in. During the summer, this is countered with automated blinds, shutters and awnings, which close at certain times of the day, reducing the solar gain. However, these automated shutters reopen again when it is darker to allow passive solar heat in, and cloSE again at dusk retaining the heat within. This is definitely a smart house as the shutters and blinds are not just automated by light, but also by CO2 concentration and the level of humidity in the house. A solar powered control system will automatically open and close the windows to maintain a comfortable environment to live in. Rainwater is also collected and supplied to the toilet and washing machine to save as much water as possible. This 1950’s home is not just about saving energy as it has been transformed from a dated house, into a modern, spacious and luxurious house that anyone would be proud to live in. The stand-alone-verandah on the side of the house, which is doubling as a garage, looks sublime attached to the simplistic white house and next to a little vegetable plot. This is the perfect house for people who love to live off the land, taking advantage of the large garden area to grow enough crops to feed their family, living in this self-sufficient home. 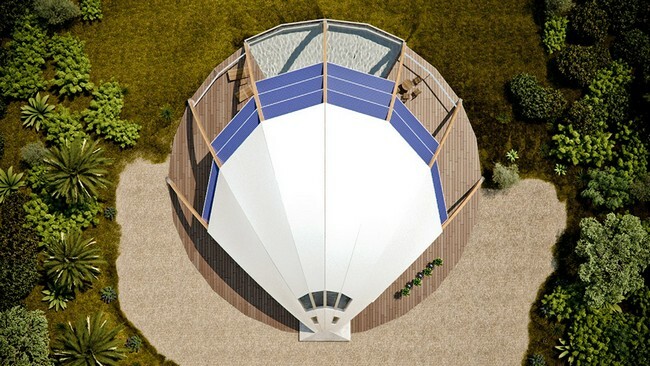 I guess this type of house gets its name from its shell-like outer design and the house within is the pearl. This house is simply divine! I LOVE this house for its astonishingly good looks and for its complex, scientific design. It was designed by David Fanchon to harness the Sun’s warmth and light, built to follow the Sun’s daily and year-round course. The front of The Pearl is full length glass, both upstairs and downstairs, allowing light to seep in and warmth to aerate throughout the rooms. However, its ingenious design means that during the winter the Sun’s benefits are harvested, but during the summer, the heat is restricted by the shape of the house and the retractable solar panels across the roof, which shades the rooms during the hottest part of the day. It’s also is equipped to battle heat with its white steel roof. The unusual design allows this home to be heated naturally, therefore resulting in less need to turn on the heating, making it much more energy efficient. However, the benefits of this house are not finished there. The shape of the house acts like a cocoon, the wooden arches, which are sourced from a sustainable wood, means the house is very durable and structurally sound, with the ability to survive high winds and earthquakes. It is built with 12 inch thick compressed straw walls and has a highly insulated roof, retaining heat within this home, reducing the annual heating bills. 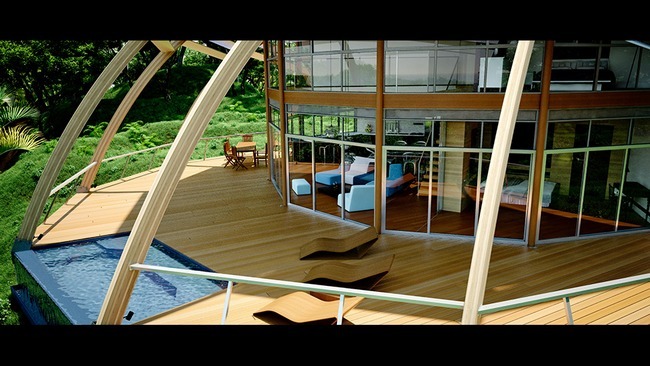 Put these structural capabilities with its sleek looks, the 180° panoramic views, the beautiful wooden decking around a crystal clear pool that overlooks the sea and you have one of the most lavish houses on the market. We can all dream of living in houses like ‘The Pearl’, but we cannot all necessarily afford it. With energy efficiency playing a huge part in building plans, and the governments continued effort to reduce Britain’s carbon footprint, it should be no surprise to see Eco-Communities popping up. 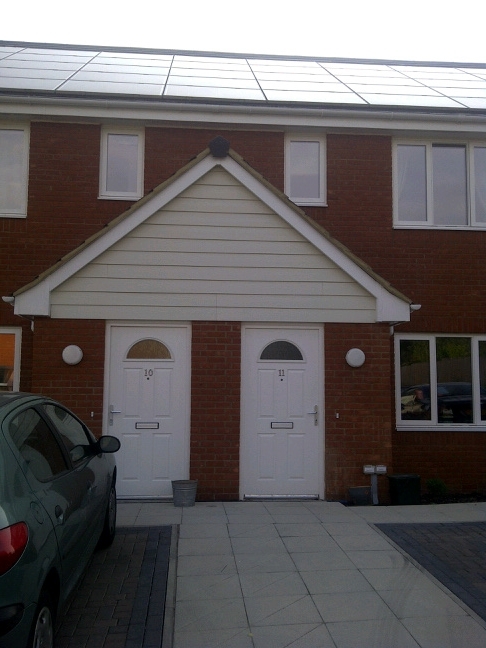 One such community was recently built in Rackheath, Norwich, aimed to be used as an example for future residential schemes. 12 schemes have been proposed and built, but Rackheath is the only site to be granted Grade A status by the Government, recognising the suitability to accommodate sustainable development. My friend happens to live in one of these self-supporting communities in a spacious 2 bedroom flat. His flat boast solar panels, efficient water utilities, good public transport links and a economical waste management system, all in the heart of a bustling community out in the countryside. The 4,000 new homes may not be as stunning as the other homes or as architecturally exciting, but they are affordable, cheaper to run and in perfect reach of local services and amenities. If you are first time buyers or a growing family, these homes would be an ideal blank canvass for you to start a new phase of your life journey. So, this is our small collection of eco-friendly homes, all striving to do their bit in the fight against carbon. What do you think about these homes? Do you live in an eco-home? If you do we would love to hear your views, whether you would like to live in one or if you like the eco-home you live in. Simply leave a comment in the panel below.